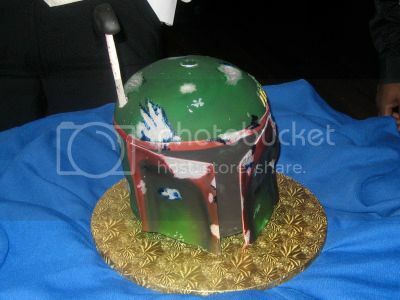 Someone either ran out of colored frosting or went a bit overboard on the whole “battle-damaged” thing on this Star Wars Boba Fett cake. It was my brother-in-law’s cake, and I know it was a dulce de leche cake inside (which was AWESOME) with fondant and modeling chocolate outside, but I don’t know who made it. Right. We don’t know who made it. Do we know who threw rocks at it before the delivery? What’s with all these beheaded Star Wars cakes? Isn’t it a little disconcerting eating that thing? Awesome cake. I must tell evilmunkywifey to make one of these for my birthday. Do we know who threw rocks at it before the delivery? LOL I don’t know why, but this really made me laugh, thanks!